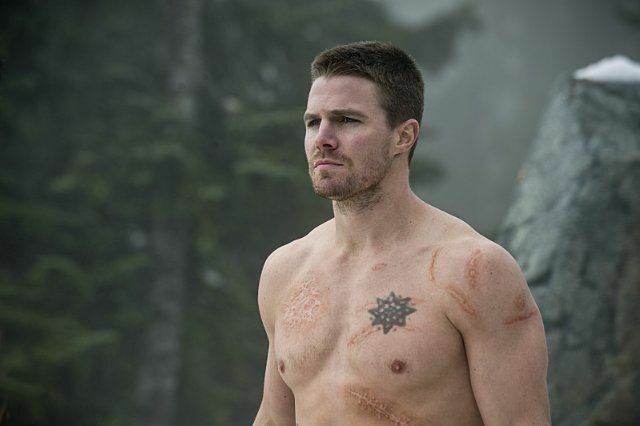 With Oliver Queen (Stephen Amell) presumed dead, after the face-off between he and Ra’s al Ghul (Matt Nable) in the Arrow winter finale, there’s no telling where Team Arrow will go next or how they’ll fare without him. What is clear is that fans of the show will have to wait a bit before learning his true fate because no one is revealing anything. 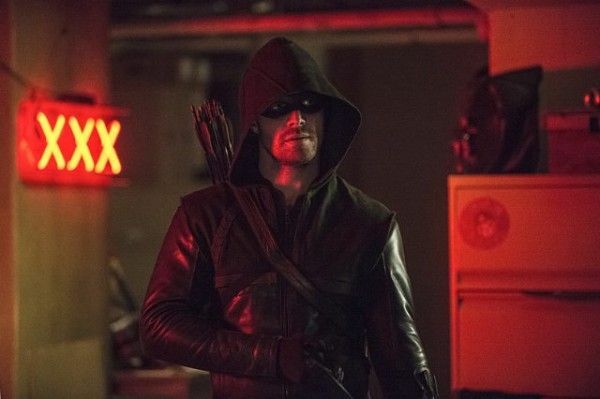 While at The CW portion of the TCA Winter Press Tour, actor Stephen Amell talked about how he personally loves it when there is adversity for the protagonists, what he thinks it would take for Oliver Queen to have survived, why Felicity (Emily Bett Rickards) is so important to him, his favorite episodes, his hope to continue to do cross-over episodes with The Flash, and the advantage of keeping the DC movie and TV universes separate. Check out what he had to say after the jump. Question: Oliver Queen is supposedly dead. 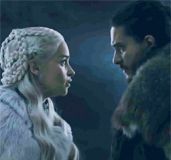 How did they warn you of how the winter finale was going to conclude, and had you been looking forward to an arc like that? STEPHEN AMELL: There was no warning. We had a very full discussion about the third season, back in late June or early July, and they said, “The first arc of our season will commence with Sara’s death, and will end with Oliver facing Ra’s al Ghul and losing. I personally love when there is adversity for the protagonists. And when we give other characters on the show an opportunity to acquit themselves and to come more into leading roles. We’re 50-plus episodes into the show, and if we don’t give other characters an opportunity to shoulder the load, then we give nothing for the viewers to attach themselves to. So, I’m excited for everyone’s opportunity. Oliver’s probably going through one of the most transformative periods of his life right now. Can you hint at all about how that will change him? What do you think it would take for him to have survived? AMELL: We just saw him fall. We’ve seen Oliver survive. So, [we don’t know] whether he went straight off the cliff, whether something broke his fall, whether he hit the ground. We have mystical herbs on the show that have healing powers. 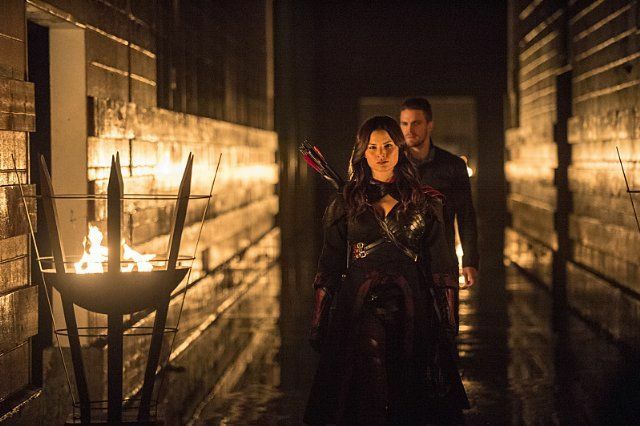 We’ve seen a Lazarus Pit, although that’s not something that’s going to be used for Oliver. I hope he survives. I like playing him. The last thought he had was of Felicity, which is really telling. Can you talk about how their relationship has come to that point, where she is so important to him? AMELL: Both Laurel and Sara were elements of his past. Obviously, Sara and Oliver tried to rekindle things. But, both of those relationships really rely heavily upon the type of person that he was before he left. As he has become more accepting, less introverted and less damaged by what happened to him the five years that he was away, the guiding principle in that transformation has been Felicity. Did you always know that relationship was going to go that way? AMELL: No, and neither did the producers, by the way. But, those things happen. along the way. With Emily and I, our characters worked well together and, as a result, that’s the direction that we took. Before this season, when I said, “There is one woman in Oliver’s life this year, and that is Felicity,” I don’t see that changing. With the introduction of Brandon’s character there was a love triangle that began with Oliver, Felicity and Ray. Would you like to see that continue? AMELL: Well, Oliver would have to certainly come back. I’m envious of Brandon’s character because of how fun and carefree he is, despite the fact that he is doing what he is doing because of a tragic event in his life that actually happened quite recently. But the big thing is that I just enjoy Brandon, personally. He and I have only worked together one day. It was the third day that we shot this year. So, I’m hopeful that sometime in the future, we’ll get to do more stuff. We’ve really seen the evolution of this universe, and all of these characters and storylines. What’s it been like for you to be at the center of all of that? AMELL: It’s been wonderful, every time we are given permission to bring someone like Grant [Gustin] on as Barry Allen, and then you see some of the guest stars that we’ve been able to get on our show. Getting John Barrowman was such a coup, in our first season. But then, you see on The Flash, Wentworth [Miller] and Dominic [Purcell] and Victor [Garber], and Brandon [Routh] for us, certainly. I feel like every time that happens, that’s a vote of confidence. With the grind of this show, when do you find time to work out and keep up the physicality that this role requires? AMELL: I wouldn’t call it a mistake, but I went so balls to the wall with the training for the pilot. The pilot was this stand-alone event, where we had 17 days to shoot one episode, I had a month to prep, and I had so much adrenaline that I was able to work out every day when we’re filming. Whereas the season is a 23-episode marathon with eight days to shoot and travel. I worked until 4 o’clock in the morning on Saturday, and then I had to travel for work yesterday and now we’re here, which is lovely, but I have to pick my spots. I have to get notice from the producers, if and when I’m going to be shirtless on the show, so that I can ramp up because I can’t go through a process where I maintain that pace of the pilot. It’s impossible. Do you have a favorite episode of the show? AMELL: I’m always going to be a slave to the recent and new. I was so proud of our mid-season finale, this year. I think that the episode when Moira died, last year, was our show’s execution at its finest. I have no doubt that there will be more, towards the end of this season, and they do happen towards the end of the season because there’s just more at stake and you’re getting the opportunity to pay off more things. I have incredibly high hopes for our 14th episode, this year. 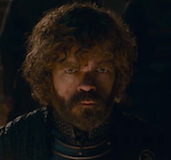 I think that, if you’re a fan of the show, and have been a fan of the show from the beginning, and have been paying attention, you’re really going to enjoy that episode. How did you enjoy getting to do the cross-over episodes? AMELL: I think that the cross-over was a new experience. I thought that they were two of the best scripts that either show has ever put forward. 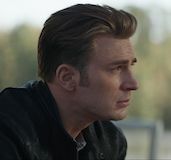 The logistical elements of it were something that we had to figure out, as we moved along, but I think that everybody did a great job, and that future cross-overs will be even bigger and better and smoother. 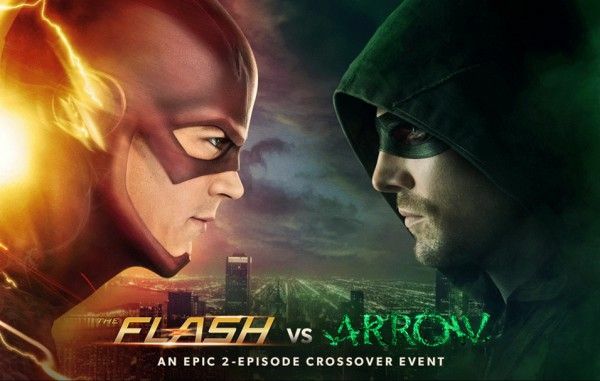 Would you like to see a more integrated universe between The Flash and Arrow? AMELL: It’s fantastic! There’s just something about the chemistry between [Grant and I], and the differences between the characters, where we each get to shine a light on the other one, and I think that light is always really illuminating. So, I do hope that we get more opportunities to cross over, and I know that we will. When The Flash debuted, you were supportive of DC giving Grant Gustin a chance at the role in the film. Now that they’ve established a separate movie and TV universe, have you made peace with that idea? AMELL: I was always at peace with the idea. I was disappointed at the timing of the announcement. It’s not about whether or not I support Grant in the movies or me in the movies, or any of these characters in the movies, it was more just about feeling that the timing of the announcement was bad. I wasn’t mad, per se. But, I’ve spoken a lot with DC people about how having a separate universe and focusing on each of those spots being the best that they can be is just as advantageous, or possibly more so, as having to focus and worry about constantly cross-breeding or cross-pollinating everything. So, I feel fine about it. 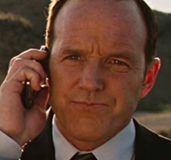 A lot of people have said, “Well, Agents of S.H.I.E.L.D. 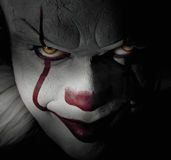 is a good show, but boy they’re just tied to the films,” and sometimes that can be a hindrance. So, I like our position.